This article is about the locality in Mumbai. For other uses, see Dharavi (disambiguation). Dharavi is a locality in Mumbai, Maharashtra, India. Dharavi compared to other large slums in the world. Map according to Mike Davis. It is considered one of the largest slums in Asia. Dharavi has an area of just over 2.1 square kilometres (0.81 sq mi; 520 acres) and a population of about 700,000. With a population density of over 277,136.26277,136/km2 (717,779.61717,780/sq mi), Dharavi is one of the most densely populated areas in the world. The Dharavi slum was founded in 1883 during the British colonial era, and grew in part because of an expulsion of factories and residents from the peninsular city centre by the colonial government, and from the migration of poor rural Indians into urban Mumbai (then called Bombay). For this reason, Dharavi is currently a highly multi-religious, multi-ethnic, and diverse settlement. Dharavi has an active informal economy in which numerous household enterprises employ many of the slum residents– leather, textiles and pottery products are among the goods made inside Dharavi. The total annual turnover has been estimated at over US$1 billion. Dharavi has suffered from many epidemics and other disasters, including a widespread plague in 1896 which killed over half of the population of Mumbai. Though large sums of money have been borrowed by the Indian government in the guise of improving sanitation in Dharavi, none of these have materialized into any development on the ground. A Dubai based firm - SecLink group has planned to redevelop the slum into a completely new area. On setting up of the SPV, the private firm will have to bring in an equity of Rs 400 crore, while the state government will invest another Rs 100 crore. The company planning to do it is also building infrastructure and affordable housing projects in Singapore and Dubai. Following the empowered committee’s nod, the senior state officials said that an MoU will soon be executed between the state government, and the Dharavi Redevelopment Project Authority (DRPA) and the company. With an almost estimated cost of over Rs 26,000 crore, the Dharavi makeover project is the biggest brownfield redevelopment project in India. To make the redevelopment more economically viable, the state government’s plan is involving transforming the region into a hub for commercial and business activity. It must be noted that Dharavi is barely away from the Bandra Kurla Complex, which is India’s richest business district, and one of the richest in Asia. In the 18th century, Dharavi was an island with predominantly mangrove swamp.. It was a sparsely populated village before the late 19th century, inhabited by Koli fishermen. Dharavi was then referred to as the village of Koliwada. Mumbai has been one of the centers of India's urbanization for 200 years. In the 1850s, after decades of urban growth under East India Company and British Raj, the city's population reached half a million. The urban area then covered mostly the southern extension of Mumbai peninsula, the population density was over 10 times higher than London at that time. Shanty dwellings next to railway tracks in Dharavi (about 2010). A mosque inside the slum is visible. The railway network provides mass transit to the slum residents. The most polluting industries were tanneries, and the first tannery moved from peninsular Mumbai into Dharavi in 1887. People who worked with leather, typically a profession of lowest Hindu castes and of Muslim Indians, moved into Dharavi. Other early settlers included the Kumbars, a large Gujarati community of potters (another polluting industry). The colonial government granted them a 99-year land-lease in 1895. Rural migrants looking for jobs poured into Mumbai, and its population soared past 1 million. Other artisans, like the embroidery workers from Uttar Pradesh, started the ready-made garments trade. These industries created jobs, labor moved in, but there was no government effort to plan or invest in any infrastructure in or near Dharavi. The living quarters and small scale factories grew haphazardly, without provision for sanitation, drains, safe drinking water, roads or other basic services. But some ethnic, caste and religious communities that have settled in Dharavi at that time helped build the settlement of Dharavi, by forming organizations and political parties, building school and temples, constructing homes and factories. Dharavi's first mosque, Badi Masjid, started in 1887 and the oldest Hindu temple, Ganesh Mandir, was built in 1913. At India's independence from colonial rule in 1947, Dharavi had grown to be the largest slum in Mumbai and all of India. It still had a few empty spaces, which continued to serve as waste-dumping grounds for operators across the city. Mumbai, meanwhile, continued to grow as a city. Soon Dharavi was surrounded by the city, and became a key hub for informal economy. Starting from the 1950s, proposals for Dharavi redevelopment plans periodically came out, but most of these plans failed because of lack of financial banking and/or political support. Dharavi's Co-operative Housing Society was formed in the 1960s to uplift the lives of thousands of slum dwellers by the initiative of Shri. M.V. Duraiswamy, a well-known social worker and congress leader of that region. The society promoted 338 flats and 97 shops and was named as Dr. Baliga Nagar. By the late 20th century, Dharavi occupied about 175 hectares (432 acres), with an astounding population density of more than 2900 people per hectare (1200/acre). A traditional pottery unit in Dharavi. Street vendors and farmers market along the road passing through Dharavi slum in Mumbai. There have been many plans since 1997 to redevelop Dharavi like the former slums of Hong Kong such as Tai Hang. In 2004, the cost of redevelopment was estimated to be ₹5,000 crore (US$700 million). Companies from around the world have bid to redevelop Dharavi, including Lehman Brothers, Dubai's Limitless and Singapore's Capitaland Ltd. In 2010, it was estimated to cost ₹15,000 crore (US$2.1 billion) to redevelop. The latest urban redevelopment plan proposed for the Dharavi area is managed by American-trained architect Mukesh Mehta The plan involves the construction of 2,800,000 square metres (30,000,000 sq ft) of housing, schools, parks and roads to serve the 57,000 families residing in the area, along with 3,700,000 square metres (40,000,000 sq ft) of residential and commercial space for sale. There is still a significant local opposition to the plans, largely because existing residents still feel 33 square metres (350 sq ft) of revised permanent alternate accommodation per tenant is not adequate each. Furthermore, only those families who lived in the area before 2000 are slated for resettlement. Concerns have also been raised by residents who fear that some of their small businesses in the "informal" sector may not be relocated under the redevelopment plan. Due to this opposition, a trust has been proposed called the Dharavi Community Land Trust that will be made up of community members, landowners, and neighborhood associations. In 2008 German students Jens Kaercher and Lucas Schwind won a Next Generation prize for their innovative redevelopment strategy designed to protect the current residents from needing to relocate. Other redevelopment schemes include the "Dharavi Masterplan" devised by British architectural and engineering firm Foster + Partners, that proposes "double-height spaces that create an intricate vertical landscape and reflect the community’s way of life" built in phases that the firm says would "eliminate the need for transit camps," instead catalyzing the rehabilitation of Dharavi "from within." The total current population of Dharavi slum is unknown, and estimates vary widely. Some sources suggest it is 300,000 to about a million. With Dharavi spread over 200 hectares (500 acres), it is also estimated to have a population density of an incredible 869,565 people per square mile. With a literacy rate of 69%, Dharavi is the most literate slum in India. About 30% of the population of Dharavi is Muslim, compared to 13% average population of Muslims in India. The Christian population is estimated to be about 6%, while the rest are predominantly Hindus (63%), with some Buddhists and other minority religions. Among the Hindus, about 20% work on animal skin production, tanneries and leather goods. Other Hindus specialize in pottery work, textile goods manufacturing, retail and trade, distilleries and other caste professions - all of these as small-scale household operations. The slum residents are from all over India, people who migrated from rural regions of many different states. The slum has numerous mosques, temples and churches to serve people of Islam, Hindu and Christian faiths; with Badi Masjid, a mosque, as the oldest religious structure in Dharavi. Dharavi is located in Ward H East, marked in dark blue, one of the many British-era administrative wards of Mumbai city limits (yellow). 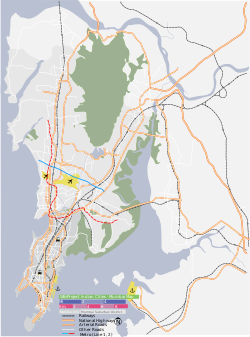 Dharavi is southern end of Ward H East, and other residential and commercial areas in the Ward marked in dark blue include Santacruz, Vile Parle and Mahim. Dharavi is a large area situated between Mumbai's two main suburban railway lines, the Western and Central Railways. To the west of Dharavi are Mahim and Bandra, and to the north lies the Mithi River. The Mithi River empties into the Arabian Sea through the Mahim Creek. The area of Antop Hill lies to the east while the locality called Matunga is located in the South. Due to its location and poor sewage and drainage systems, Dharavi particularly becomes vulnerable to floods during the wet season. Dharavi is considered one of the largest slums in the world. The low-rise building style and narrow street structure of the area make Dharavi very cramped and confined. Like most slums, it is overpopulated. Compared to Mumbai's urban floor space index (FSI) of a range from 5 to 15, in Dharavi it is about 13.3. Government officials are considering changing the Dharavi's floor space index to 4. Despite the expensive Mumbai lifestyle, Dharavi provides a cheap alternative where rent is as low as Rs.1000 per month. An embroidery unit in Dharavi. In addition to the traditional pottery and textile industries in Dharavi, there is an increasingly large recycling industry, processing recyclable waste from other parts of Mumbai. Recycling in Dharavi is reported to employ approximately 250,000 people. While recycling is a major industry in the neighborhood, it is also reported to be a source of heavy pollution in the area. The district has an estimated 5000 businesses and 15,000 single-room factories. Two major suburban railways feed into Dharavi, making it an important commuting station for people in the area going to and from work. Dharavi exports goods around the world. Often these consist of various leather products, jewelry, various accessories, and textiles. Markets for Dharavi's goods include stores in the United States, Europe, and the Middle East. The total (and largely informal economy) turnover is estimated to be between US$500 million, over US$650 million per year, to over US$1 billion per year. The per capita income of the residents, depending on estimated population range of 300,000 to about 1 million, ranges between US$500 to US$2000 per year. Potable water is supplied by the MCGM to Dharavi and the whole of Mumbai. There's a large amount of water lost by way of water thefts, illegal connection and leakage. The community also has a number of water wells that are sources of non-potable water. The original power supply was undertook by the Brihanmumbai Electricity Supply and Transport (BEST), which distributes power to the island city. In year 2007, BEST had drawn up a plan for segregating Dharavi from the rest of the city. It was reported that power supply to Dharavi would be privatised on the lines of Bhiwandi to curb power thefts. There are still settlement houses that do not have legal connections to the utility service, and rely on illegal connection to the water and power supply. Dharavi has severe problems with public health. Water access derives from public standpipes stationed throughout the slum. Additionally, with the limited lavatories they have, they are extremely filthy and broken down to the point of being unsafe. Mahim Creek is a local river that is widely used by local residents for urination and defecation causing the spread of contagious diseases. The open sewers in the city drain to the creek causing a spike in water pollutants, septic conditions, and foul odors. Due to the air pollutants, diseases such as lung cancer, tuberculosis, and asthma are common among residents. There are government proposals in regards to improving Dharavi's sanitation issues. The residents have a section where they wash their clothes in water that people defecate in. This spreads the amount of disease as doctors have to deal with over 4,000 cases of typhoid a day. There is also an average of 1 toilet per 500 people. Dharavi has experienced a long history of epidemics and natural disasters, sometimes with significant loss of lives. The first plague to devastate Dharavi, along with other settlements of Mumbai happened in 1896, when nearly half of the population perished. A series of plagues and other epidemics continued to affect Dharavi, and Mumbai in general, for the next 25 years, with high rates of mortality. Dysentery epidemics have been common throughout the years and explained by the high population density of Dharavi. Other epidemics reported include typhoid, cholera, leprosy, amoebiasis and polio, through recent years. For example, in 1986, a children cholera epidemic was reported, where most patients were residents of Dharavi. Typical patients to arrive in hospitals were in late and critical care condition, and the mortality rates were abnormally high. In recent years, cases of drug resistant tuberculosis have been reported in Dharavi. Fires and other disasters are common. For example, in January 2013, a fire destroyed many slum properties and caused injuries. In 2005, massive floods caused deaths and extensive property damage. A few travel operators offer guided tours through Dharavi, showing the industrial and the residential part of Dharavi and explaining about the problems and challenges Dharavi is facing. These tours give a deeper insight into a slum in general and Dharavi in particular. Riwa Fort, also known as Kala Qilla or Black Fort, is a fort in central Mumbai (Bombay), India on the banks of the Mithi River. The fort is currently in a dilapidated condition amidst the Dharavi slums. It was built by the first governor of Bombay, Gerald Aungier (1669–1677). It was part of the larger Bombay Castle, and marked the northern portion of British-held Bombay in the 17th century. The castle was also used as a watchtower, guarding the territory against the Portuguese-held (and later Maratha-held) Salsette Island. From the main road leading through Dharavi, the place makes a desperate impression. However, once having entered the narrow lanes Dharavi proves that the prejudice of slums as dirty, underdeveloped, and criminal places does not fit real living conditions. Sure, communal sanitation blocks that are mostly in a miserable condition and overcrowded space do not comfort the living. Inside the huts, it is, however, very clean, and some huts share some elements of beauty. Nice curtains at the windows and balconies covered by flowers and plants indicate that people try to arrange their homes as cosy and comfortable as possible. Dharavi was most notably used as the backdrop in the film Slumdog Millionaire (2008), which well-explored the slum. It has also been depicted in a number of Indian films, including Deewaar (1975), Nayakan (1987), Salaam Bombay! (1988), Parinda (1989), Dharavi (1991), Bombay (1995), Ram Gopal Varma's "Indian Gangster Trilogy" (1998–2005), the Sarkar series (2005–2008), Footpath (2003), Black Friday (2004), No Smoking (2007), Traffic Signal (2007), Aamir (2008), Mankatha (2011), Thuppakki (2012), Thalaivaa (2013), Bhoothnath Returns (2014), Kaala (2018) and Gully Boy (2019). Dharavi, Slum for Sale (2009) by Lutz Konermann and Rob Appleby is a German documentary. In a programme aired in the United Kingdom in January 2010, Kevin McCloud and Channel 4 aired a two-part series titled Slumming It which centered around Dharavi and its inhabitants. The poem "Blessing" by Imtiaz Dharker is about Dharavi not having enough water. For The Win, by Cory Doctorow, is partially set in Dharavi. In 2014, Belgian researcher Katrien Vankrunkelsven made a 22-minute film on Dharavi which is entitled The Way of Dharavi. ^ "Dharavi in Mumbai is no longer Asia's largest slum". Times of India. 2011. Retrieved 9 November 2018. ^ Gayatri Ramanathan (6 July 2007). "Shanty-towns emerge targets for development". Livemint. Retrieved 27 December 2016. ^ a b c Ahmed, Zubair (20 October 2008). 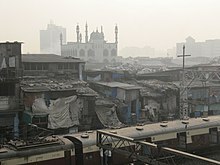 "Indian slum hit by New York woes". BBC News. Retrieved 1 May 2010. ^ a b "Jai Ho Dharavi". Nyenrode Business Universiteit. Retrieved 5 March 2010. ^ The Mumbai Slum Sanitation Program - Partnering with Slum Communities for SustainableSanitation in a Megalopolis (PDF). Washington: World bank. 1 September 2006. Retrieved 15 November 2018. ^ "Dubai firm to transform Asia's biggest slum". gulfnews.com. Retrieved 12 April 2019. ^ D'Cunha, Jose Gerson (1900). "IV The Portuguese Period". The Origins of Bombay (3 ed.). Bombay: Asian Educational Services. p. 265. ISBN 978-81-206-0815-3. Retrieved 4 January 2009. ^ a b c d e Mark Jacobson (May 2007). "Dharavi Mumbai's Shadow City". National Geographic. Retrieved 30 April 2007. ^ a b c Weinstein, Liza (June 2014). Globalization and Community, Volume 23 : Durable Slum : Dharavi and the Right to Stay Put in Globalizing Mumbai. Minneapolis, MN, USA: University of Minnesota Press. p. 5. ISBN 9780816683109. ^ a b "Calls to scrap Dharavi makeover gain ground". The Times of India. 20 August 2010. ^ a b Madhurima Nandy (23 April 2010). "US firm exits Dharavi project citing delays". Livemint. Retrieved 7 November 2012. ^ "Dharavi redevelopment plan is robbing us of space: residents". Live Mint. 5 September 2007. Retrieved 7 December 2015. ^ info@lafargeholcim-foundation.org, LafargeHolcim Foundation for Sustainable Construction. "Realizing solutions for the redevelopment of Dharavi, Mumbai, In". LafargeHolcim Foundation website. Retrieved 20 August 2018. ^ "Mumbai's slums are India's most literate – Mumbai – DNA". Dnaindia.com. 27 February 2006. Retrieved 16 August 2010. ^ Madhurima Nandy (23 March 2010). "Harvard students get lessons on Dharavi". Livemint. Retrieved 7 November 2012. ^ "Dharavi". BBC. Retrieved 2 January 2010. ^ "Now, a toll-free helpline to check water leakage, theft - Indian Express". archive.indianexpress.com. Retrieved 8 December 2015. ^ Naik, Yogesh (24 February 2007). "Dharavi electricity supply will be privatised soon". The Times Of India Mumbai. ^ "Cooking gas cylinders to be sold at petrol pumps". Daily News and Analysis. 24 July 2013. ^ "Piped gas becomes more attractive for the kitchen". Daily News and Analysis. 14 September 2012. ^ "Slumming It: Dharavi". Channel 4. Retrieved 8 April 2009. ^ Sse Productions bvba (3 April 2015). "Documentary - The Way Of Dharavi 2014". Retrieved 30 April 2017 – via YouTube. Wikimedia Commons has media related to Dharavi. Mark Jacobson (May 2007). "Dharavi Mumbai's Shadow City". National Geographic. Retrieved 30 April 2007.